Preheat the oven to 425 degrees F. Line a baking sheet with parchment paper. Melt 2 tablespoons butter. 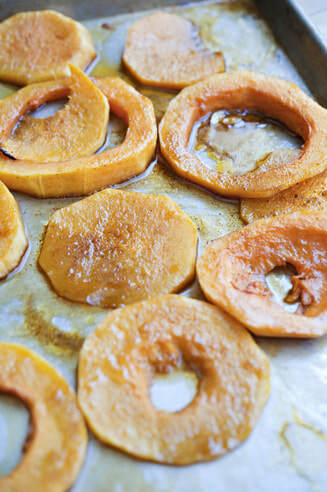 Toss the squash with the melted butter, maple syrup, chili powder, and salt and pepper to taste on the prepared baking sheet. Roast until golden and soft, about 20 minutes. Set aside and let cool. Meanwhile, melt 1 tablespoon butter in a medium skillet over medium-low heat. Add the onion and toss to coat. Cook, without stirring, until the onion begins to develop a deep brown color, 10 to 15 minutes. Stir and add the balsamic vinegar, sugar, and salt and pepper to taste. Cook, stirring, until the onion mixture thickens and develops an intense sweetness, about 15 more minutes. Sandwich build! Butter 1 slice of bread. 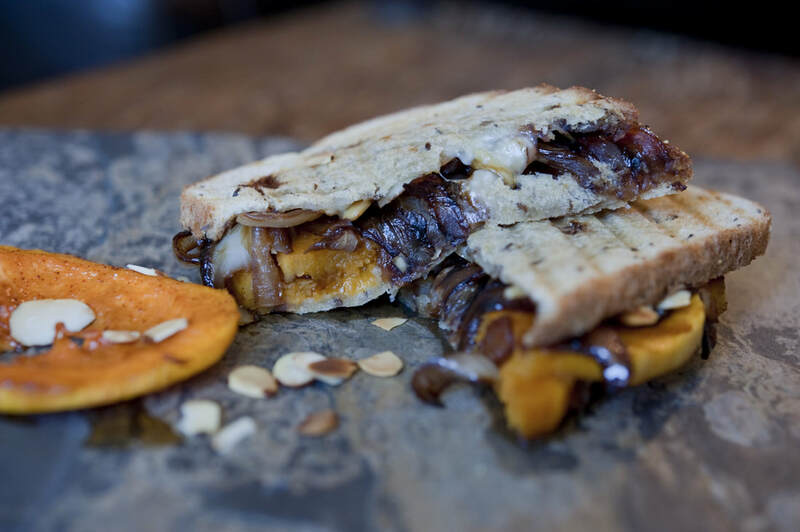 On the unbuttered side, add the ingredients in this order from the ground up: manchego, squash, caramelized onion, sliced almonds and more manchego. Close with another buttered bread slice, buttered side up. Repeat with the remaining ingredients to make 3 more sandwiches. Heat a heavy griddle or flat pan over medium heat. Melt the remaining 2 tablespoons butter in the pan. Lightly cook each sandwich, in batches if necessary, until the cheese starts to melt, 3 to 4 minutes per side. Low and slow is the key here so you don't kill your bread before the delicious innards get gooey.